In addition to the most popular options listed below, Aqua Phase can be customized to fit your special needs. If you have special requirements or need additional information, contact Aqua Phase. Automatic application of disinfectant solution. Uses separate fluid distribution system from wash/rinse system. Optional item for all models. Convenient means of expanding the functionality of the Aqua Phase Washer. Protects Wheelchair Wheel Rotation System when washing items other than wheelchairs. Slides in and out of wash chamber for easy loading. Optional item for AQ-1000, AQ-2000, and AQ-3000.. 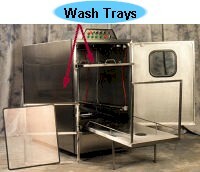 Stainless steel Wash Trays designed for holding smaller items to be washed. When used with the Equipment Rack, creates two levels for items to be washed. Slide in and out of wash chamber for easy loading. Optional item for AQ-1000, AQ-2000, and AQ-3000. Rotates the front & rear wheels of a wheelchair for superior cleaning. 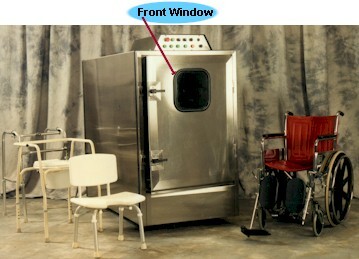 Minimizes the need for pre-treating wheelchair wheels prior to washing. 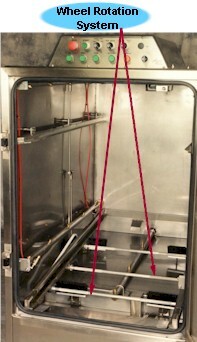 Includes the Wheel Carriage Loading Rack (see below) and includes scrub brushes that contact wheels while washing. Optional item for AQ-1000. Included as standard feature on AQ-2000 and AQ-3000. Wheelchair Wheel Carriage Loading Rack for easy loading and unloading of wheelchairs. Loading rack slides forward and back inside of wash chamber. The Loading Rack is a component of the Wheelchair Wheel Rotation System. Lets you view inside the Wash Chamber during operation. Window is made of safety glass minimizing potential for breaking or shattering. Optional item for AQ-1000 and AQ-2000. Included as standard feature on AQ-3000 and AQ-4000.